This Thursday marks AMD’s third quarter update of Radeon Pro Software Enterprise, AMD’s enterprise and workstation graphics drivers. 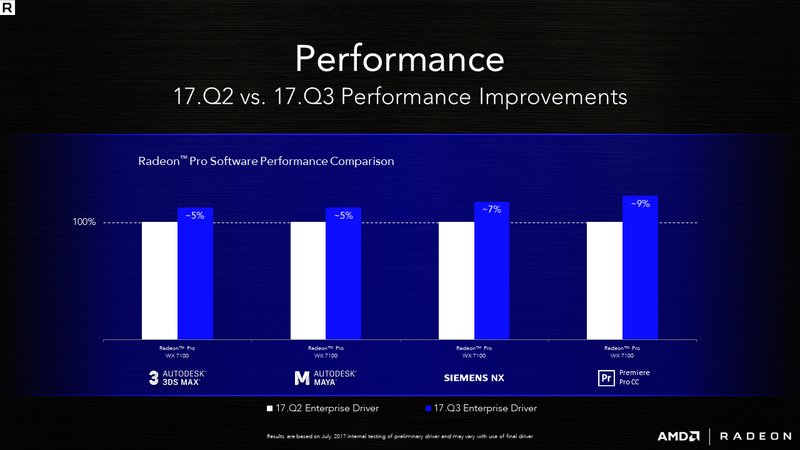 While Radeon Pro Software Enterprise 17.Q3 is not as extensive as last quarter’s 17.Q2, this release continues the pace of post-FirePro enterprise-ready software support, standing adjacent to this week’s major Radeon Software 17.7.2 launch. Introduced last fall as a replacement to the AMD FirePro drivers, Radeon Pro Software Enterprise exists separately from the standard consumer Radeon Software and general professional Radeon Pro Software. As the namesake suggests, Radeon Pro Software Enterprise is geared towards enterprises, with workstation application certification and regular updates on the 4th Thursday of every quarter. Radeon Pro Software Enterprise also comes with 24/7 Radeon Pro support and AMD’s Prioritized Enterprise Support program, where AMD works with the customer, OEMs, and ISVs to provide priority engineering support. 17.Q3 sees official support for the Radeon Pro Duo (Polaris), Radeon Pro WX 3100, and Radeon Pro WX 2100, all products that were launched after the release of 17.Q2. 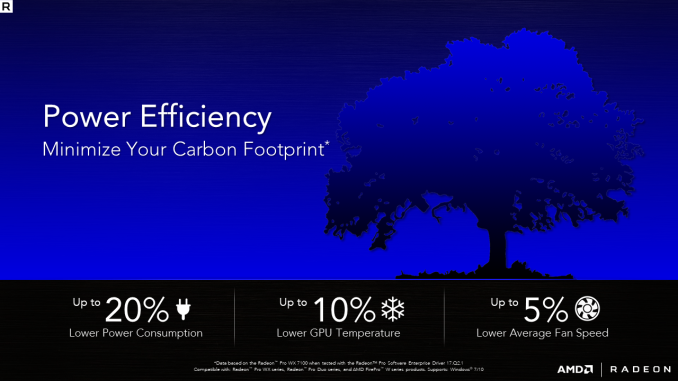 For older products, AMD did note substantial gains for the WX 7100 with respect to power consumption and professional application performance. For 17.Q3, AMD has also added support for the Windows 10 Creators Update. In addition, AMD has added 8K resolution and Dell High Dynamic Range display support, as well as VR support for Autodesk VRED. In terms of bug fixes, the 17.Q3 driver release has resolved issues with external monitor auto switching when plugging into mini-DisplayPort/DisplayPort/HDMI/DVI ports on SG/Spec graphics mode. A WX 7100 audio output compatibility issue was also resolved in certain 8K panels when dual DisplayPort cables were plugged in. Similarly, AMD fixed WX 4100 compatibility issues with certain 8K monitors running DX applications at full resolution. Lastly, setting a multi-GPU single-large-screen to maximum resolution should no longer cause unexpected display issues. 17.Q3 is compatible with the Radeon Pro WX and Pro Duo series, as well as the FirePro W and S series. The updated drivers for AMD’s workstation graphics are available through at the AMD workstation graphics driver download page. 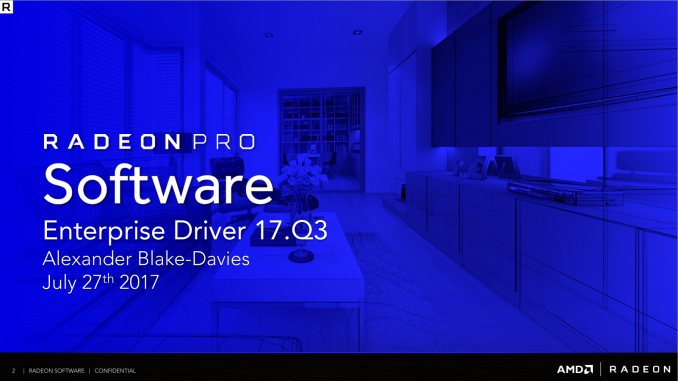 More information on this update and further issues can be found in the Radeon Pro Software Enterprise Driver 17.Q3 release notes. Future Radeon Pro Software Enterprise releases will follow on October 26th 2017, January 25th 2018, and April 26th 2018.